Paul Arnal Park : Above the Rochefort, a dolomitic rocky crown over viewing Florac, this park ins forming, with its 12 ha forest a green belt around the surge of the ”Vibron” more usually called ”Spring of Pêcher”. The quiet lanes winding towards the surging waters mingles broad-leaved and resinous trees . Widely shadowed this park is dedicated to rest : laying into the grass is allowed as well as having a picnic : tables and benches are let to the disposal of the public. Close to the park and for the most sportive people , a short path into the forest, has been installed - to keep fit. 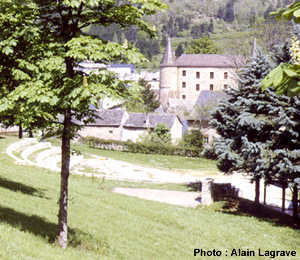 One can have access to the Park crossing by the ”draille” bridge which once led the sheep herds on their road to the plateau of Causse Mejean for summer pasturages. A car park located between the castle (sheltering the National Park of Cevennes headquarters ) and the bridge allows its approach. A former mill and the trout farm (for repopulation and reintroduction into rivers ) of the Fish department office crossing the Vibron embellish the entrance. 110 km From Nimes - 40 km from Mende (N106). Follow the direction "Parc National des Cevennes - Château. Car Park Place F. Mitterand square.